If you ask a small pool of people what type of sambal they prefer with their nasi lemak, you’ll get a range of answers ranging from the ‘sweet type’ to the ‘slightly spicy’ and even the ‘I would like to leak out of my head level of pedas’. Whatever the answer, it’s clear that each person has their tolerance level but not all are willing to stay complacent with theirs. Some are willing to take a chance and be a little more daring the next time they order a plate of Malaysia’s trademark meal. Thankfully, the latest Volkswagen Golf Mk7.5 follows the sambal levelling guide closely, and you can have yours in four different flavours – 1.4 TSI (Sportline and R-Line), GTI and R. Naturally, we’d like to find out what these cars are like to drive and to experience first hand, the results of the performance (and price) gap between them. 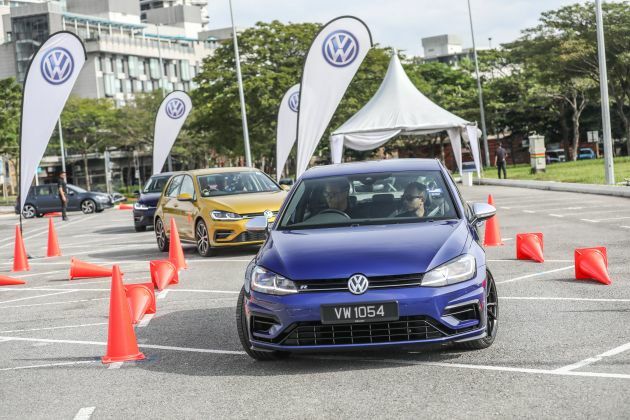 In our quest for better clarity, Volkswagen Passenger Cars Malaysia (VPCM) gave us a chance to sample the updated Golf range with a brief, two-day trip down south to Johor. Our choice of vehicles included the Golf 1.4 TSI R-Line, the GTI and the R, with the car in the middle being our starting point. As with previous iterations, the Golf GTI remains understated in appearance, with touches of red accents being reminders that it has more going power than the 1.4 TSI-powered models. Visual updates as part of the Mk7.5 update include new LED-type adaptive headlamps and taillights with a dynamic turn signal function. We spent most of the morning to afternoon on the highway, which wasn’t particular taxing on the EA 288 unit under the bonnet. The 2.0 litre turbocharged four-pot makes 230 PS (up 10 PS from the Mk7) and 350 Nm, which is sent to the front via a six-speed, wet dual-clutch DSG transmission. It’s a quick car this, with 0-100 km/h being accomplished in just 6.4 seconds and if you’re not careful, the 248 km/h top speed is within easy reach, as we found out. The wide torque curve (1,500 to 4,600 rpm) makes overtaking a breeze and the DSG remains a familiar smooth operator, with shifts being quick and largely unnoticed. A coasting function is present in Eco mode – one of five selectable driving modes within the Adaptive Chassis Control (DCC) system – whereby the engine and gearbox are decoupled when well, coasting. A notification in the new 12.3-inch Active Info Display virtual instrument cluster lets you know when this is taking place, and reengagement of both components is seamless. Slip the car into Comfort mode and it perfectly settles down for the highway tour, delivering a relatively comfortable ride without fuss. There is still some firmness when rolling over minor road imperfections but it isn’t to the point of being shocking. There’s no denying the capability of the GTI as a highway cruiser, but it is in the twisty bits where the fun is had. Peeling off the main highway, our convoy detoured towards the roads leading up to Bukit Putus so the reserved hot hatch can be let loose a little. Calling upon Sport mode for this part of the drive, the GTI’s drivetrain came to attention, holding on to gears longer to ensure the engine remains in the optimum power band. The steering also gets weighted up, while the suspension firms up further so tiny bumps become even more noticeable. On runs up and down the hilly route, the GTI remained progressive and easy to manage at speed, with the steering offering good precision despite the artificiality of electronic assistance. Even without manual intervention via the paddles, the DSG was competent in delivering the right gear when needed, with downshifts coming about only when you really depress the right pedal. Handling-wise, the GTI is very responsive on turn-ins and you’ll need to be going quite fast into a corner to coax the car into understeer. However, the GTI’s XDS+ brake-based torque vectoring system is present to minimise this likelihood – just be reasonable with your speed. The car’s safety nets do help in more dire situations by trimming output, allowing you to better regain control. Should you turn them off like my co-driver did, be prepared as the GTI will be more than willing to gradually wag its tail. 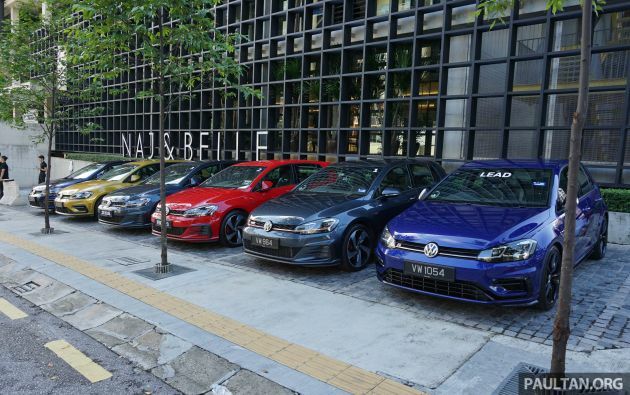 Following the brief hill climb, our convoy continued on to Melaka, where we swapped keys for something a little more potent – the Golf R. The highlights here include 290 PS and 380 Nm from a 2.0 litre TSI, seven-speed, wet DSG and a 4Motion all-wheel drive system. It’s also the most visually striking of the three, with large intakes on the bumper, larger wheels and off-coloured side mirrors. The evening drive into Johor found us almost entirely on the highway, and the effects of the R’s higher outputs were certainly felt. It takes 1.3 seconds less to do the century sprint (5.1 seconds) compared to the GTI and you’re only limited to a 250 km/h top speed. As was the case with the GTI, the R will hit comical speeds with minimal effort while delivering rather subdued pops and bangs out of the exhaust – you’ll want it in Race mode for the most noise. Time spent on the highway also revealed the R’s ride as being even firmer than the GTI, with unpolished tarmac being felt more even in Comfort mode. Our meeting with the R-Line only took place on the second day of the itinerary on a makeshift autocross course on an empty parking lot. With short sprints and tight corners to navigate, the performance capabilities of each model will certainly be highlighted here. Surprisingly, the R-Line proved to be quite a hoot to drive, despite being a dolled up version of the 1.4 TSI with fancier 17-inch rims, Active Info Display and an exterior styling kit meant to mimic the hotter R.
Mechanically, it is unsurprisingly the least powerful of the lot, with just 150 PS and 250 Nm from the 1.4 TSI. It takes 8.2 seconds to hit 100 km/h from a standstill and the top speed is just 216 km/h. Clearly the R-Line isn’t winning any drag races with its siblings but once you’ve built up some momentum, it is a remarkably nimble car that can be confidently tossed around the bends. In its sportiest driving mode, the seven-speed, dry DSG does well to maintain a ratio but any override will require you to move your hand to the centre console as there aren’t any paddle shifters at your disposal. From a handling perspective, the R-Line doesn’t have the quickest steering (even in Sport mode), the suspension is the softest of the lot and the brakes aren’t really all that beefy. On the daily drive, that’s more than sufficient, but if you do plan to take it on an autocross, it won’t be as dull as you’d think. Done with the R-Line, we next found ourselves back in the seat of the GTI. 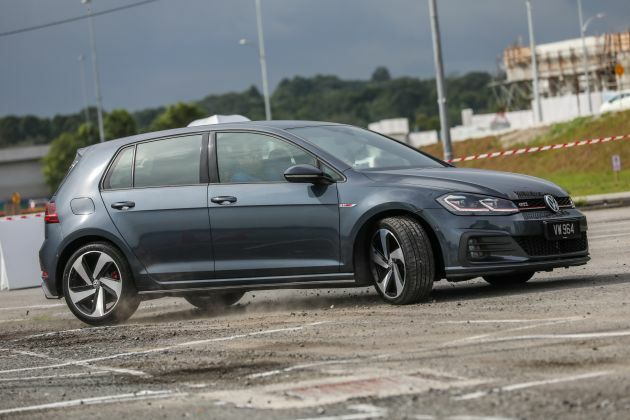 With access to more power and more performance-oriented suspension, the GTI certainly was a lot livelier than the R-Line but getting the 2.0 litre TSI to lay down its power did prove to be a challenge given the sandy surface and tight exits. You’ll also want to fiddle with the paddles to keep the revs up where the turbo works its best. Compared to the R-Line, my first run in the GTI saw the safety nets periodically kicking into action in an attempt to restore order, which largely resulted in loss time or lack of power out of corners. Switching these systems off on the second run allowed gradually more rotation to be introduced when needed, while the stickier tyres provided assistance on exits where patches of sand weren’t an issue. 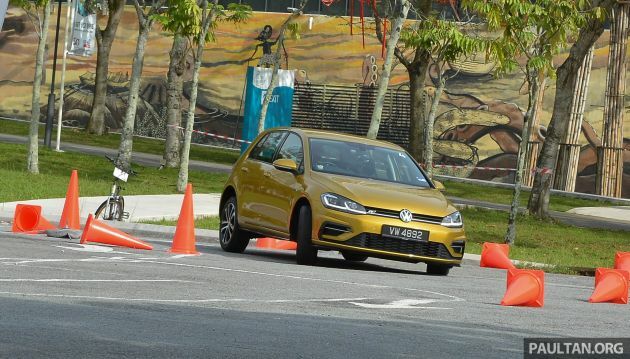 Between the GTI and R-Line, both cars felt similarly competent in the corners but the added grunt of the former certainly helps during straighter sections. While both cars are capable of delivering autocross experiences that are within proximity of one another, the Golf R is a different beast altogether. Simply put, the Golf R requires you to rewire your brain to actually compensate for its performance capabilities. Sections where you’re used to a particular entry speed on the R-Line and GTI are suddenly alien to you as the R’s rapid acceleration sees you being launched from gate to gate, with the 4Motion system hard at work to claw you forward as rapidly as it can. If it isn’t the outright pace, the stronger brakes and sharper steering also require adjustments to ensure turn-ins aren’t overly sharp, or excessive speed is shaved. It isn’t easy to get right, as a tipped over cone will tell you, but it certainly is an addiction to keep trying at it. Make no mistake; the R is a big leap in performance from the GTI, and a quantum one over the R-Line. In fact, one should sample the entire Golf range from the 1.4 TSI-equipped models to the GTI and R to better understand what’s being offered here. As a daily runabout, the Golf R-Line is the perfect choice with a responsive and efficient powertrain, good practicality and a rather generous equipment list – the base Sportline just doesn’t cut it in the looks department. Active Info Display aside, the new 8.0-inch Composition Media is a treat to use and has one of the better Android Auto/Apple CarPlay integrations than other brands. The GTI is my personal pick, with a manageable amount of power and sharper handling that doesn’t come at a severe compromise to ride comfort. Like the R-Line, it too gets a well specced interior, although I could live without the Vienna leather seats – fabric tartan seats, anyone? If you’re the kind of person that often associates the word ‘most’ with ‘powerful’, the R is the only way to go. With a wider scope of performance that is supported by its all-wheel drive system, the R demands more of you than vice versa. This comes at a rather high price point, although you do gain a fancier 9.2-inch touchscreen Discover Pro infotainment system and even larger alloys. The Golf range is a well-rounded one, and does well to meet the different needs of car buyers out there. From the regular to the utterly exciting, it’s up to you to decide just how pedas you want it to be. I’ve shared my pick, what’s yours?